The team won’t forget the moment we arrived at PBC Mafraq. Within seconds of us arriving several of the children had already helped put out all our stumps, while the rest of the group finished up their session with Right to Play, playing a simple game using hula hoops and trying to pass them round a circle without letting go of each others hands. From the off we knew the kids loved sport and that we would have a great day, regardless of what sport we were going to play. What followed was a mixture of excitement and relief as within 15 mins the children were all playing our adapted cricket-based activities: relays, “ready steady throw” and “head shoulder knees toes ball”. We very quickly established that English means nothing in the Jordanian suburbs we were woking in, and communicating effectively through the whole trip would be key. At one point Thambi pulled me and Ed aside and said “what we like about Cricket Without Boundaries is that you are willing to work with anyone, which s ays a lot about your organisation” Right to Play were keen to echo this throughout the day; we couldn’t have had a better reception. The game “ready, steady, throw!”, where players aim to knock down stumps with whiteboards balanced on them, helped us to begin to ask the participants: what are your worries in your life? We have all been wary from the off how the discussion sections of these games would work, and the types of stories we would be hearing. 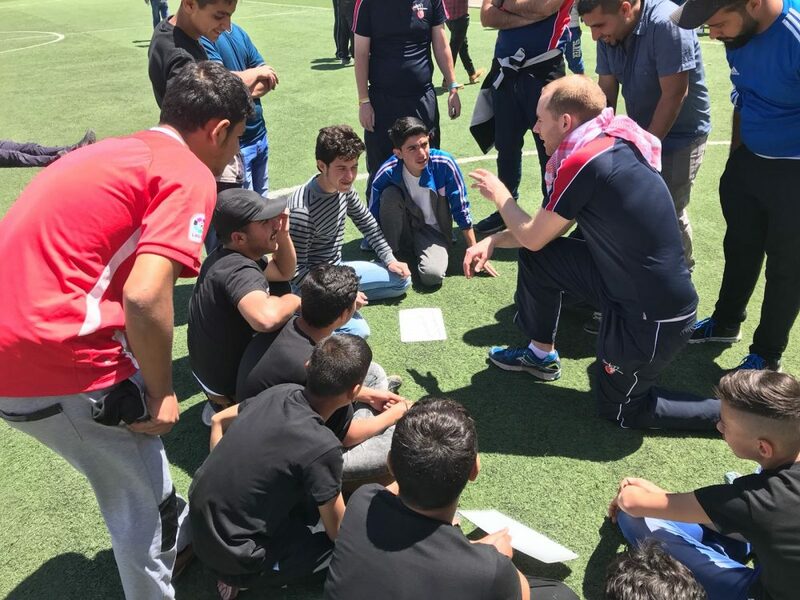 It was immediately apparent that sport and having the kids active broke down barriers of communication and while they were initially tentative, stories were soon pouring out of the children and they were keen to discuss their worries and the issues they face in terms of integrating into the community. Stories ranged from the violence they faced both in their home country and now in Jordan, to being forced into working in order to survive and support their families, with one 13 year old working as a mechanic and consequently missing out on schooling. After the heat of the morning we were innovated into the community centre to meet with representatives from both the UNHCR (United Nations High Commissioner for Refugees) Mafraq community centres, who’s main job is to relay issues from the community to UNHCR, and representatives from Right to Play. There was a good dynamic in the room; it was the first time that Right to Play and UNHCR had worked together, which CWB had facilitated. We left promising them we wanted to have an impact in Mafraq going forward, and that working in partnership with them will be key to success. While Jamie, Ed and Jules were in the meeting the rest of the team joined a few of the Right to Play coaches at Ala’sayl Association where they use a lot of play-based learning to support their children. We were surprised to hear that very little of this play centred around sports, and was more commonly in the form of songs and other simple indoor games. We agreed with the centre staff that we would show the group the fundamentals of cricket, and that they would then show us some of their activities. Within a handful of minutes we were outside with stumps set up, and with children’s remarkable ability to observe and then do we soon had two batsmen running between the wickets after they hit the ball, a queue of bowlers at least some of whom were trying to launch the ball with a straight arm, and fielders eagerly running around to catch, retrieve the ball and throw it in. When we turned the session over to the Right to Play coaches we were surprised to see them immediately go to set up “ready steady throw”, which they had seen earlier in the day. It was a pleasure to watch as they figured out how to set up, explain and run the game. With some gentle encouragement we managed to get 2 games running side by side and boys and girls competing against each other to knock down the stumps. A final go at “3-2-1 Go!” concluded the session with plenty of energy and enthusiasm. It was the perfect time for Jamie to arrive with a bag of 24 falafel wraps which we devoured perched on the kerbside, a routine we would soon become familiar with, before being invited back in to have a drink of thick sugary Jordanian coffee. As the head teacher of the school fired up the keyboard to play us some tunes I even had the opportunity to once again lose a dance off in a new country, taken to big school by a lad with some serious shapes.